A specific part of managing the meta data on your site is making sure social networks understand and classify as well as possible the content on your pages. Though this won't directly help you rank better on search engines result pages, social networks are often a very good way to reach out to people interested in the material on your site. They may in turn get you mentions and links on other web sites, and that will have a positive impact on SEO. 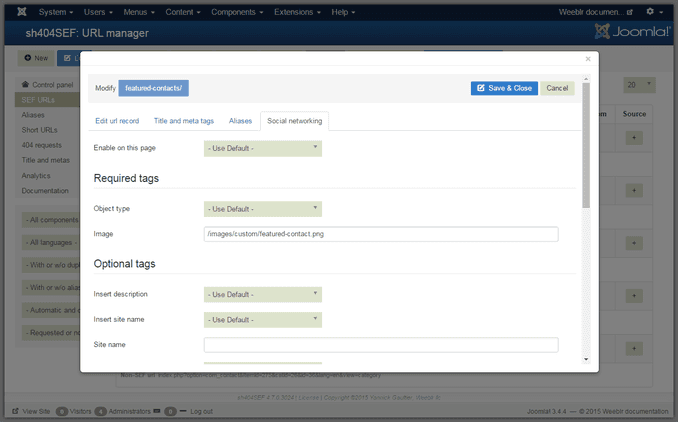 sh404SEF can automatically insert OpenGraph and Twitter Cards tags inside your pages. By default, tags are based on already existing title and meta data tags , but as usual, you can also manually customize all those values. As you have spent time and effort on your website content, you want to make it easy for visitors to share it with others. Doing so will bring you direct traffic, and will also help search engines discover new pages. sh404SEF can automatically insert common social networks buttons on your page, with many parameters to alter their display or content. Currently Facebook, Twitter, Google+, LinkedIn and Pinterest buttons are available.